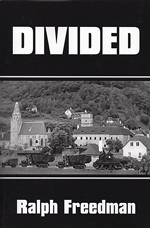 A World War II era novel about love, betrayal, honor and loss, Divided focuses on a small Austrian town in the tension-filled days between the German retreat and the Russian occupation. 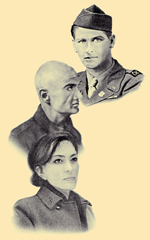 A small unit of American intelligence agents try to root out the remaining Nazi sympathizers and prepare the town and themselves for the changes peace will bring. Divided goes back to the last days of the Second World War, just as do its contents. I conceived of the story while I was serving with a group of counter-intelligence agents after the end of the actual fighting. Read an excerpt on Twilight Times Books website. Divided is available through Amazon.com and Barnes & Noble. Ralph Freedman, who grew up in Nazi Germany, emigrated at 19 to England and ultimately the United States. He served in the US Army during World War II, in Tunisia, Sicily and Italy, afterwards graduating from the University of Washington and earning a doctorate at Yale. He taught 12 years at the University of Iowa, 22 at Princeton and for two post-retirement years at Emory University. He wrote and published two novels (Divided, 1948 and Rue the Day, 2009), criticism (The Lyrical Novel, 1963), biographies of Hesse (1978), Rilke (1996), and many essays. His works have been translated into German, French, Italian, Spanish, Korean, and Japanese. A Chinese version of the biography of Rilke is in press. Enter your email address to subscribe to Ralph Freedman's blog and receive notifications of new posts by email.